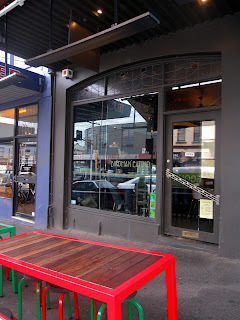 Located on Gertrude Street, Fitzroy, near the Smith Street intersection, Birdman Eating takes its name from a range of sources including Moomba Festival and the ancient myth of Icarus. The quirky space is sandwiched between a record store that wafts chill-out tunes and a barbershop that guarantees a free beer with every haircut. Outside the long, wooden benches lined with red and green double as a look out. You can soak up the atmosphere of the street and it's also ideal for people watching. With everything from colourful Mohawks and Doc Martens to those with instruments in hand, there is no shortage of statement fashion. Inside, a whole new world awaits you. An interesting light sculpture made from globes and cooking whisks is suspended from the ceiling. Surrounding it, a number of flexible wooden people, usually used for figure drawing, have had their arms removed and replaced with feathers as mascots for the business. 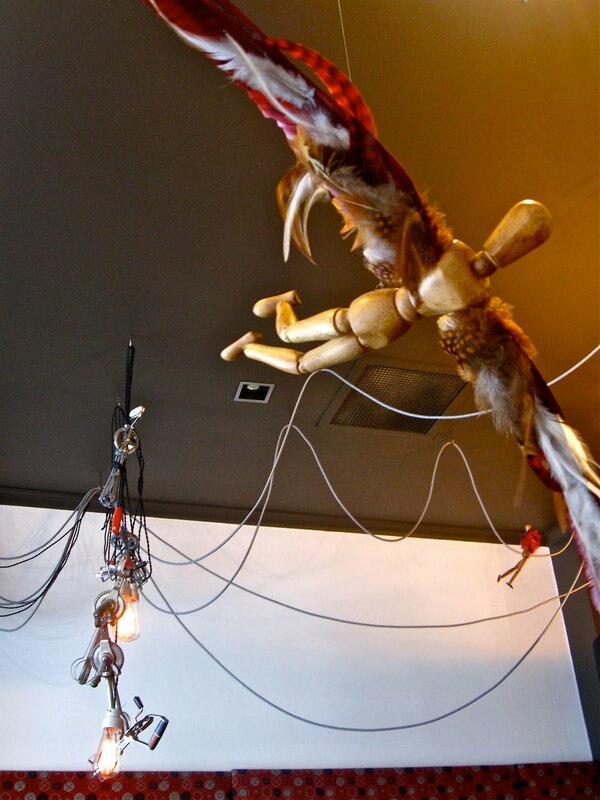 These ‘birdmen’ hang from fishing wire and come to life each time someone enters or leaves the room, swinging to life and twirling in the breeze. For seating, dark tables are highlighted with red and green chairs. 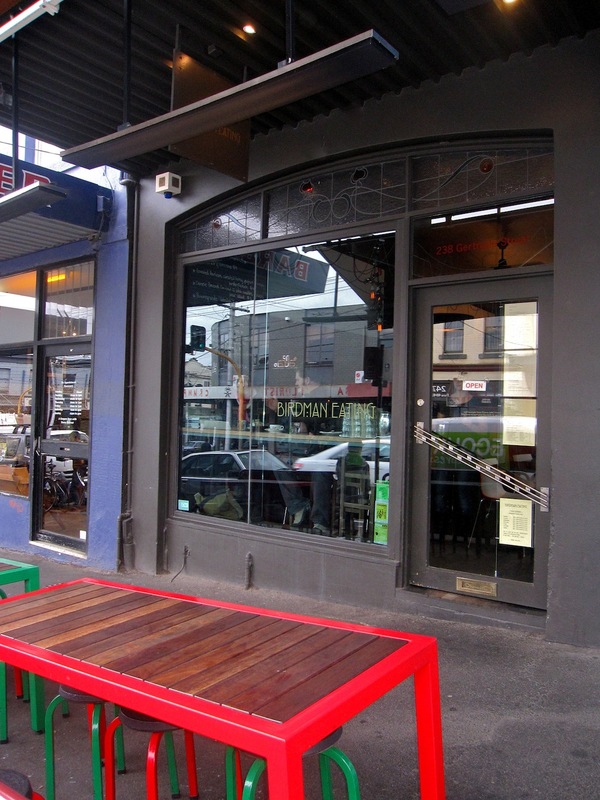 Alternatively, you can chose to sit on stools facing the window, regular chairs and tables, or you can fight your acquaintance for the comfortable bench seat that lines the right wall. Luckily, we visited after midday, which meant we could order something from the breakfast and lunch menus to share. After strongly considering the coconut quinoa porridge with banana and palm sugar, we ended up trying the corn, broccoli and ricotta hotcakes served with creamy smoked trout, avocado and Spanish onion. We also ordered from the lunch specials, trying the roasted heriloom carrots with honey yoghurt and crispy bunderfleisch (dried, cured beef). The flavours were perfectly complimentary, combining the pickled texture of the beetroot-coloured carrots with the crispy beef and side salad, topped off with sweet yoghurt sauce. 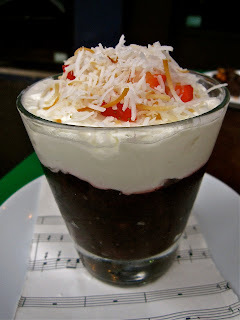 It was a small portion, perhaps better suited to a starter or a tapas style lunch, but it meant we still had room for the black rice with coconut yoghurt. The yoghurt had the most amazing texture of fluffy cream, and the dish came in a crystal glass served with strawberries (instead of the mango stated on the menu - the chef had judged mangoes to be “no good at the moment,” informed the incredibly friendly waitress). To finish, the tea was served in delicate, floral pots and the Genovese coffee was a hit. But the best part of the meal had to be the homemade honeycomb. Covered in dark chocolate, it has an airy, melt-in-the-mouth consistency. I could actually feel the honey oozing out as it dissolves on my tongue. 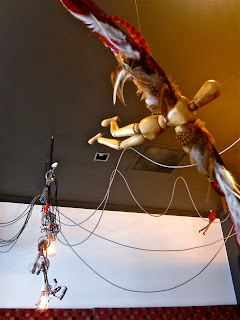 Birdman Eating also has an appreciation for the arts, which shows in the little touches. Food served in small bowls and glasses comes perched on squares of music score. Birdman also supports local artists by giving you a printed, one-off postcard to accompany the bill. When I next return it will be for the tapas-style dinner. Although the assortment of options on the menu is overwhelming, the problem is solved thanks to the chef tasting menus (minimum 2 people). You can order the Tweetie Menu ($35 per head) or the Big Bird Menu ($45 per head, including specials and dessert). Birdman Eating is definitely something to tweet about. Four and a half out of five smooches. In Greek mythology, Icarus was the son of the master craftsman Daedalus. 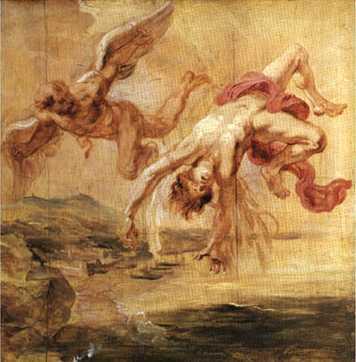 Icarus attempted to escape from Crete using wings constructed by his father. He ignored warnings not to fly too close to the sun, and fell to his death.